We have all experienced deafening silence - when the peace and solitude seems to resonate and with sighs of satisfaction you almost hear your soul singing. In the middle of the flocked Colorado forest the booming quietude was impossible to ignore. It was captivating, yet seemed to be constantly competing with creaking, grinding noises of my boots as I slowly trudged up the snowy trail. Struggling to describe the sounds I soon came to the conclusion that ‘crunchy then soft’ seemed apt - my snowshoes crunched through the upper layer and squeaked on the downey under-layer. Ah, “crust on fluff” came the description from our naturalist guide Peter, obviously far more acoustically experienced in the matter. Snowshoeing is a wonderful way to enjoy Alpine scenery. Away from the flurry of the ski slopes you are one-on-one with nature, reaching pristine regions few have the privilege of experiencing. With new snowshoe manufacturing techniques there has been renewed interest in this ancient activity and people of all ages and ability are becoming avid walkers. We were in the White River National Forest near Vail with Walking Mountains. Equipped by our guide before setting out, the layers soon came off as we tackled the first steep incline. I was surprised at the exertion, but once mastering the technique of leaning forwards I floated over the snow, luckily not falling backwards. Blue sky highlighted glistening crystals on the surrounding snowcapped peaks. Our small group chatted as we tramped, discussing local ecology as we passed mountain thyme, Rose-hip and Douglas firs. But the ghostly white Aspens fascinated us. With a combined root system they are actually one large organism and, despite the plethora of choice, elk always return to the same tree to give birth. Chewing the bark is thought to provide pain relief (it contains an aspirin-like substance), yet being amazingly practical it also contains an SPF 8 factor which Native Americans used for sun protection. The silence was soon punctuated by a new sound and we chanced on a red-headed woodpecker chiseling his mark on the trees. Declining in number it was a lucky sighting and we appreciated his busyness, head moving backwards and forwards in a blur as he pecked. Dragging our snow-laden feet away and heading further up the hill, Peter soon spied mountain lion prints next to the trail, mother and cubs having passed through only a few hours before. It was fascinating acknowledging that despite the comforting beauty of the scenery we were truly in the wild. Once at the summit we enjoyed the endless panorama of shimmering snow and verdant vegetation. Our snowshoes were still, our breathing deep and we felt satisfyingly tired standing on top of this immaculate world. It was impossible to not feel invigourated, so with renewed gusto we leant backwards and headed down, richer in experience and ripe for more discovery. The importance of getting to these unspoiled areas cannot be understated as appreciation is paramount for their protection. Welcoming locals ask you to explore this special area and spread word of its beauty which will help in its conservation. Walking with a knowledgeable guide only heightens the enjoyment and understanding. So as the snow begins to fall, pop on the snowshoes and break the silence and a trail through these magnificent mountains. Words and Photographs by Angela Terrell. Photographs from where you'd rather be ... New York based photographer Olya Matvieieva has spent the past four years capturing analog images of nature and the sea. Choosing sparsely populated places as her subjects - silent, isolated corners - she travelled to Big Sur in California, an area that has appealed to artists and writers like Hunter S. Thompson and Jack Kerouac and overlooks the mighty Pacific Ocean. Here Olya felt like she had found her home. "It was the most memorable trip and maybe when I'm older it would be great to retire there. Red woods all the way to the ocean, what else do you need?!" You can view Olya's work on her website, allforsilence.com. We met Tom Bunning in a coffee shop in South London where he greeted us with coffee and a portfolio. Understandably, we fell instantly in love with his photographed world, made up of etherial landscapes that play with light and scale and intimate portraits that capture the sitter's soul in the most artful way possible. We just had to chat to him about what makes his work so easy to get completely lost within. Where to start. I think I love a photo’s ability to transport the viewer: be it back to a special memory; forward to a place they’d love to visit, or to give a glimpse into a person’s mind. But in less romantic terms, I’m basically a lazy painter. If I found that wielding a paintbrush gave me as much immediate pleasure as taking a photo does I’d probably be trying to do that now, probably rather badly. For me the greatest pleasure right now is to be able to earn a living doing something that I love. Fingers crossed that continues. I also really enjoy seeing other photographers’ work. I feel part of a community of like-minded souls, all of us trying to create something meaningful or beautiful or interesting, using photography to try to make sense of our world. Can you remember the first photograph you took? I don’t think I can remember the first photo I took, but I can definitely remember an early view that inspired me to take pictures. I grew up in a very small village in Suffolk, our home was surrounded by fields and the view from my bedroom window was of a giant oak tree set in the centre of a field. All year round I’d watch the colours of the landscape change and in the summer the old proud oak would stand tall in the centre of a bright yellow square of rapeseed flowers, the small window providing a perfectly framed photograph in my mind’s eye. My inspirations have changed over the years I’ve been growing - both as a photographer and as a person. When I seriously started trying to take pictures for a living I was working at Abbey Road Music Studios (it sounds glamorous but I was mostly in a dark room QCing music videos!) so my early work was definitely inspired by rock and roll. I had several great years of shooting live gigs, taking portraits of musicians and touring with bands, interspersed with fashion work, which I think went hand-in-hand quite naturally. In recent years I think I’ve become earthier, more inspired by the natural world if you like, and I think this change in personal perspective has affected what I’m inspired to shoot professionally. One of my current projects is entitled Crafted and is a series of photos documenting and celebrating those in Britain who make the small, the hand-crafted and the individual. I’ve always been interested in England’s landscape and heritage and I suppose Crafted is an extension of this interest, focusing in closer on the personal aspect of our environment. On the flip-side, as my commercial work increasingly takes me further around the world, I’ve been enjoying capturing foreign landscapes. I’m still developing as a photographer and my style will continue to change over the years but I like to think it’s honest, clean and simple. I don’t like to over-process or over-edit my shots and I always try to get what’s on the back of the camera as close to how I want it before it gets to the editing stage. Of course some clients know exactly what they’re after in terms of a feel or look of a shot and when that’s the case I think you have to find the balance between your personal style and their needs - always a challenge but a fantastic one. I recently had a great meeting with an agency and they described my work as having a ‘very gentle approach’ which was a lovely thing to hear. As I touched on above, it has done much more so recently. My commercial work over the last year or so has taken me around the world to all sorts of incredible places, from Seoul to Islay, from Vietnam to New York, Kuala Lumpur to LA, among others - although I should say that amidst all this excitement I’ve had many shoots in dirty parts of London to keep my feet on the ground! I think the thing about travelling for me is that as a full-time Londoner, living and working in the fast lane, being away gives me an opportunity to expand my view of the world and gives me time to see things I probably miss at home. Something that seems very ordinary to locals can look extraordinary through a foreigner’s eyes. Has there been a particularly memorable project either past or present? I would have to say my ‘Death Valley’ series from earlier this year, wonderfully displayed here by your good selves! One of my current gigs is working with David Beckham and his team for Haig Club Whisky which has been an absolute pleasure. In the grey depths of January I flew to the sunshine state for a promotional shoot for Haig. 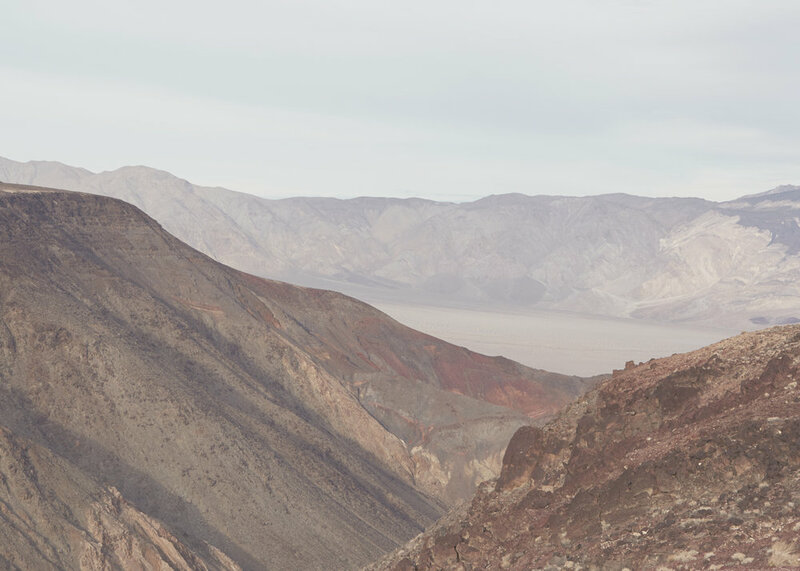 The shoot was only for the day but it would have been rude not to make the most of it so my assistant Danny and I stayed out there for a week, hired a car and took a road-trip from LA to Vegas via Death Valley where I spent several days shooting a series of landscapes. An absolute dream trip. The colours and expanse of the landscape out there were so rich and photogenic and I’m really pleased with the results. What is your dream subject? That’s a tricky one. In terms of humans I love photographing interesting faces, be they young, old or in-between. I’d love to turn my lens on someone like John Hurt or Morgan Freeman but equally so on a sheep-farmer or a dress-maker. Landscape-wise I have a real hankering to go to Iceland. I don’t have much experience of working with such a cold clear environment and, having recently invested in the new PhaseOne IQ250, I’d love to get out there with it and see what I can capture. My ultimate goal is to bring the two main aspects of my work closer together, working on location to take portraits of interesting subjects, set in interesting environments. I’ve recently had my new book made, by Cathy Robert at Delta Design who’s done a wonderful job, so I’m in the process of making appointments with agencies. Much of my recent work is showcased on my site at www.tombunning.com. I plan to exhibit the Crafted series next year in London so look out for that.